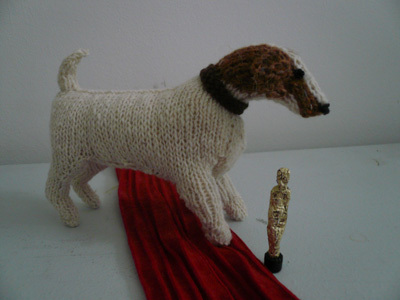 We felt we had to make our own tribute to Uggie the undisputed star of The Artist, so here he is with the oscar that he won’t be receiving, so we’ve made him his own. Here he is again performing his famous lying on his back trick. and again on the red carpet. 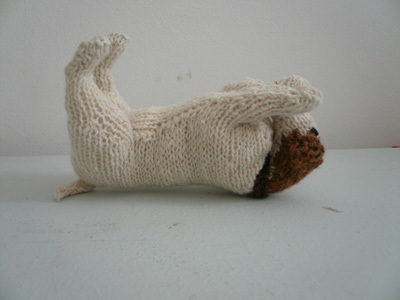 You can make your own Uggie, from Knit your own Dog, just do the Jack Russell, We have made Uggie in fine Rowan Heritage Tweed, 376 Bell Busk, with Reeth 372 markings, as he is a rough haired Jack Russell. 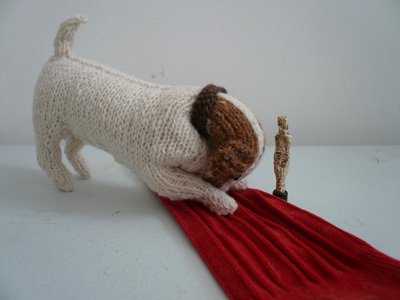 The Oscar is made out of Bendicks Bittermint papers and the end part of a screwdriver and the red carpet is a sock.